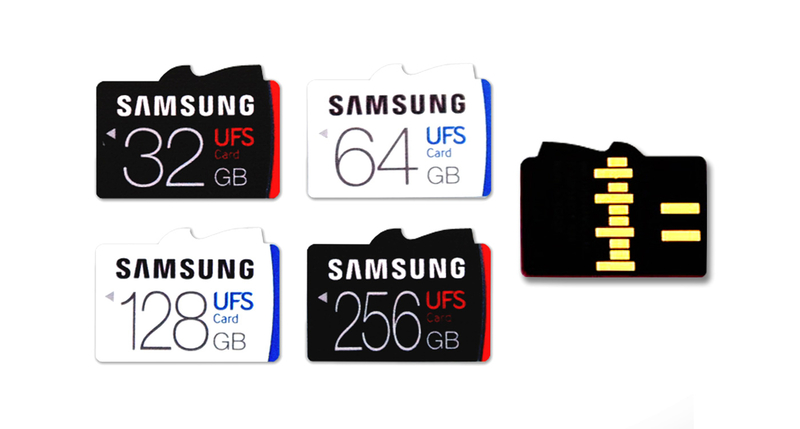 Samsung today introduced the world’s first flash memory cards in UFS form-factor. The cards are compliant with the UFS Card 1.0 specification and offer performance comparable to that of desktop SATA SSDs. It is worth noting that the new cards are not backwards compatible with current microSD devices, which use various versions of SD cards, but they open doors to new levels of removable storage performance as the spec will develop in the coming years. The new UFS memory cards from Samsung rely on the UFS 1.0 Card Standard (single 5.8 Gbps lanes) published earlier this year. 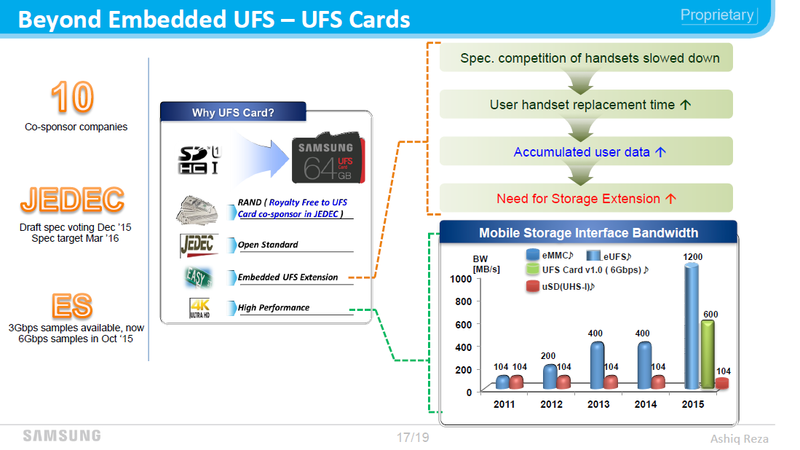 Samsung intends to offer UFS cards with 32, 64, 128 and 256 GB capacities. The top-of-the-range 256 GB UFS card will offer sequential read performance up to 530 MB/s and sequential write performance up to 170 MB/s. 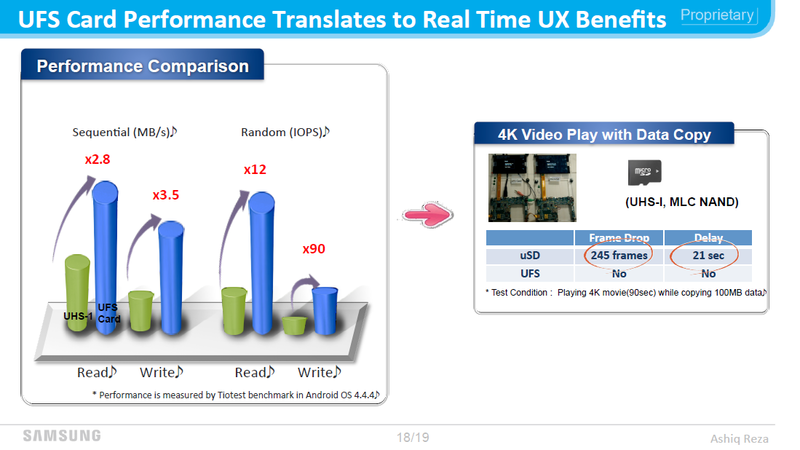 As for random performance, then Samsung declares 40,000 read IOPS and 35,000 write IOPS for the 256GB version. The Universal Flash Storage specification for consumer electronics was published around five years ago and is currently used to connect SoCs to NAND flash storage inside smartphones and other devices. UFS relies on the SCSI transfer architecture as well as on an M-PHY and UniPro electrical interface developed by MIPI Alliance. The SCSI architectural model allows the storage to take advantage of multiple commands with command queuing features, and thus greatly improve random read/write performance for NAND flash storage by supporting simultaneous reading and writing. Meanwhile, the M-PHY interface with 2.9-5.8 Gbps data-rate per lane gives a significant increase in bandwidth for NAND devices. The boosted performance typically helps speed up loading of applications, or capturing images or videos in higher resolution (and/or with enhanced bit-rate). UFS-compliant memory cards bring the advantages of SCSI and M-PHY to removable storage in card form-factor. Samsung positions its UFS memory cards for a variety of future compatible devices, such as DSLRs, 3D VR cameras, drones, mobile devices and other electronics, which benefit from high-performance removable storage. At present, none of such devices are commercially available, but with new cards approaching, it is logical to expect makers of devices to catch up. The world’s first UFS memory cards have passed Universal Flash Storage Association (UFSA)’s certification program, which assesses electrical and functional specifications. 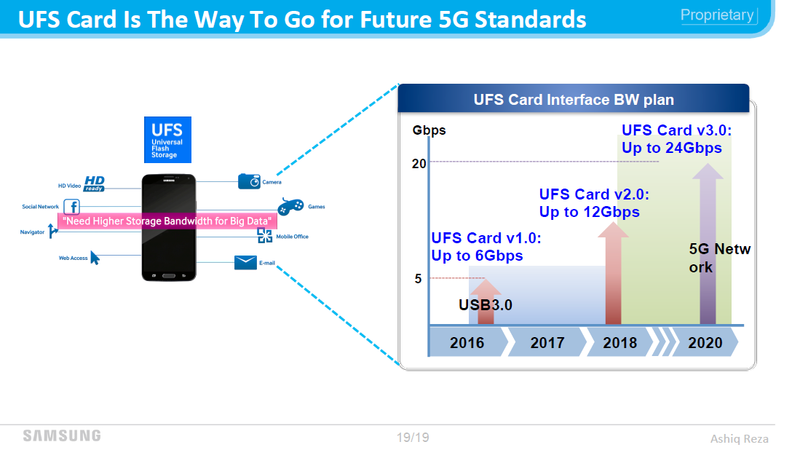 As a result, Samsung will be able to start selling its UFSA-certified UFS cards as soon as the first devices with appropriate card readers launch. Other makers of NAND flash memory and products based on it, such as Micron, SK Hynix, Toshiba and Western Digital (SanDisk), will also likely launch their UFS memory cards in the coming months and quarters. Since the UFS standard is developing (currently consumer electronics use UFS 2.0 spec for non-removable storage) and is expected to advance to versions 3.0 and 4.0 in the coming years. It is expected that the removable UFS card line will also improve to the newer standards over time. 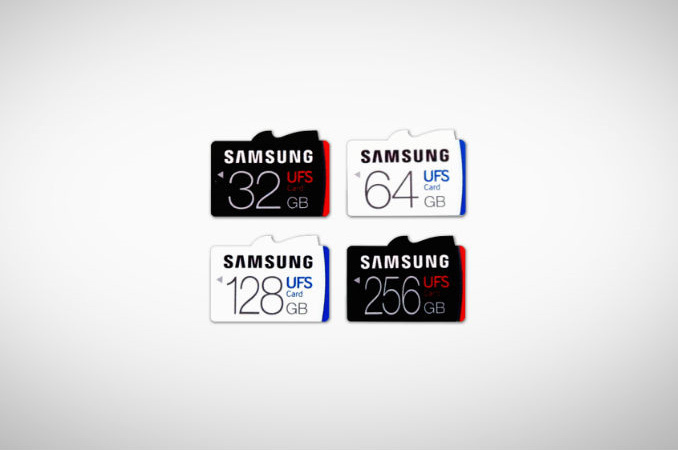 Samsung did not touch upon pricing or availability of the upcoming UFS memory cards. It's well beyond a handful by now, unless we define that very differently... But it didn't start to happen until last year and this year, whereas the cards have been around for 3-4 yrs at least. The most expensive pro sport cameras don't use SD at all which might mitigate adoption rate a bit for the newer standards in non-sport pro bodies andand consumer cameras. Even now some only support it or require it for 4K video but don't fully exploit the speeds available for burst shooting (Panasonic)... Fuji, Samsung, and others are using em pretty well tho. Remember last week when I said sandisk/western digital released a confusing, obsolete product and idiots showed up arguing a 95 mb/s UHS-I card was "fast" and "better than a 10 year old mechanical boot drive" ? LOL? Thank you Samsung for once again pushing the envelope. FYI, read the original thread here if u want to see how dum dum the inter webs can truly get. Like the guy who begs for a pat on the head without realizing he's talking about two different and incompatible products, one that is ubiquitous on the market today and can be used in current day devices and one that has approximately 0 compatible devices available now or in the near future. And you're jumping the gun without even knowing availability and pricing. I think you guys are missing the point completely. MicroSD is slow. It's old. The industry seems ot be afraid to leave it for something better as they're afraid they'll lose their market shares when a new technology emerges.